The beauty in this machine is its simplicity! 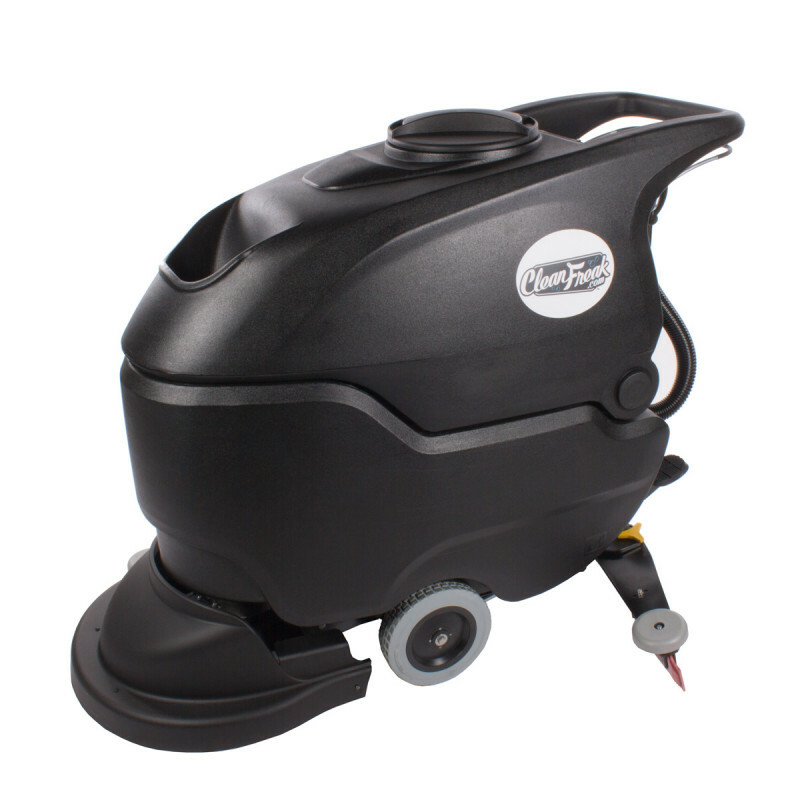 Compared to a lot of our other automatic walk behind scrubbers, the CleanFreak 'Performer 20' auto scrubber has fewer gizmos and gadgets, which equals fewer repairs and headaches down the road. A simple control panel features, a brush on/off button, a vacuum on/off button, a full recovery tank light, and an empty solution tank light. When the empty solution tank light comes on, there will be enough solution left for a full 2 minutes of scrubbing. The drive for the machine is brush/pad driver assisted and operated with a lever on the handle. Scrub pads and/or brushes need to be purchased separately depending on the type of flooring you need to clean. A pad driver does come standard with the machine. When the handle is released the machine continues to scrub and vacuum for a few seconds to recover all solution left on the floor. The solution control lever is located on the rear of the machine and is controlled by a solenoid. The 'Performer 20' is truly a work horse, easily cleaning a 30,000 square foot facility on a full charge. This machine is perfect for small to medium sized cleaning applications. Great for warehouses, medical facilities, and schools. If you are looking for something that will cover a larger area in smaller amount of time, please take a look at this machines big brother, the Performer 24 industrial auto scrubber. This introductory video shows you how to properly adjust your squeegee blades depending on whether they are not picking up in the center, on the sides, or if they are leaving streaks on your floor. Either click on the video thumbnail to the left, or go to our Performer auto scrubber squeegee adjustment page for written instructions, as well as a video that walks you through adjusting your squeegee assembly. If you are looking for this machine to come with all of its possible accessories, please take a look at our hard floor scrubbing package. You get the machine plus 2 cases of scrub pads, a scrub brush, a strip brush, 2 cases of floor soap, a 1/2 case of defoamer, 2 wet floor signs, and a set of replacement squeegees. A great value since we throw in the 2 squeegees and 2 cases of pads for FREE. Vacuum motor is mounted in the highest part of the machine and is protected by a filter and water level sensor. Recovery tank can be tilted for easy cleaning. External battery charger quick connects to the rear of the machine. Spin-on / spin-off brush and pad driver. Brush head and squeegee system designed to absorb harsh impact. Customers who were interested in the CleanFreak® 'Performer 20' Automatic Floor Scrubber were also interested in the following items. I use this scrubber in a few different settings, but I just started cleaning the floors of a cross fit gym. There are two types of rubber flooring and it passes over both easily while still scrubbing with great power and efficiency. It has made our cleaning processes extremely better. Whether doing deep cleaning or floor maintenance protocols this scrubber is a very good choice. We use this scrubber everyday. Way better than the old Tennant scrubber we used to have. This machine is well built & costs way less than the model Tennant was trying to sell me. I would buy this scrubber again & again. Love this machine! Thanks to Mary for helping me find what I needed. We love this scrubber for our hangers and the airport common areas. It does a nice job. I use these for my flood restoration business and they work great for the final cleanup. The only downside is the battery charge time. You have to re-charge for 6 hours once they run down. We could never use electric scrubbers though, so we run a few of these at a time. Works great in most areas, but some high traffic areas didn't clean up as easy. This is a review for the CleanFreak® 'Performer 20' Automatic Floor Scrubber.